Airship 27 Productions is proud to present the 10th Volume in its best-selling mystery anthology series, Sherlock Holmes – Consulting Detective. According to the stories of Sir Arthur Conan Doyle, Sherlock Holmes, while battling his arch foe, Prof. Moriarty, was lost in the Falls at Reichenback and presumed dead, though his was body was never recovered. Upon his return to London four years later, Holmes informs Dr. Watson that he had been traveling Europe and the Far East under the disguise of a Norwegian named Sigerson. Now, in a novella length adventure, I.A. Watson delves deeper into those missing years, revealing who it was that accompanied the Great Detective during those missing years. This is one of four brand new stories that fill this 10th volume of Airship 27 Productions’ best selling series. Writers Aaron Smith and Greg Hatcher offer up their own unique tales; among these a clever burglar who robs from the rich while they attend theater performance and in another, Holmes and Watson come to the aid of former Baker Street Irregular accused of murder. Once again three of the finest New Pulp writers breathe life into Conan Doyle’s classic characters and spin exciting, suspenseful tales of mystery and intrigue. 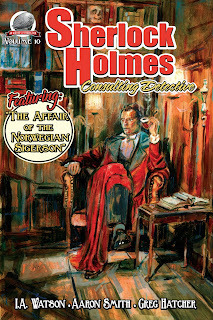 As ever award winning Art Director Rob Davis provides the beautiful interior illustrations and Graham Hill delivers a truly marvelous cover painting of Holmes at rest in his 221 B sanctum. So, dear readers, sit back, pour yourselves a brandy and prepare to enjoy a truly wonderful collection of stories starring the one and only Sherlock Holmes – Consulting Detective. Available now from Amazon in both paperback and soon on Kindle. 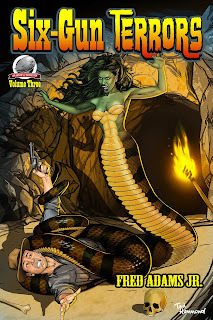 Airship 27 Productions is thrilled to announce the third volume in author Fred Adams Jr.’s weird western series, SIX-GUN TERRORS – The Slithering Terror. When a plague of rattle snakes descends on parts of the frontier, striking terror in the hearts of local farmers and ranchers. General Sherman, representing the federal government, once again seeks out the services of his two most reliable scouts, cow-punchers Durken and McFee. Content with their current occupation working for cattle baron Homer Eldridge, the ex-Union scouts are reluctant to answer the General’s summons. Such past missions have led them straight into encounters for the supernatural in truly horrific ways. This new assignment is no different, as the two must lead a cavalry company into the heart of Indian Territory seemingly infested with poisonous reptiles. Their primary goal: discover the reason for this plague and whether it is merely nature gone wild or something a great deal more sinister. Author Fred Adams Jr. once again blends authentic western action with gut-wrenching horror as he weaves a twisted, nightmarish tale of slithering terror that will keep readers up late at night. Artist Art Cooper provides the interior illustrations with Ted Hammond the beautiful horrific cover in the classic pulp vein. This is another great chapter in a weird western series quickly becoming a fan favorite.